Godefroy 28 Day Mascara (25 Application Kit) is a non-toxic formula that contains no coal tar derivatives or hydrogen peroxide agents. This fast acting, gentle formula does not damage the eyelashes and delivers rich, long-lasting color tint for up to 4 weeks. Made in Sweden. Available in Black (701) or Brown (702) Application Kit. Godefroy 28 Day Mascara (Single Application Kit) is a non-toxic formula that contains no coal tar derivatives or hydrogen peroxide agents. This fast acting, gentle formula does not damage the eyelashes and delivers rich, long-lasting color for up to 4 weeks. Made in Sweden. - Available in Black Single (701-SGL) or Brown Single (702-SGL) Application Kit. Godefroy 28 Day Mascara (25 Application Kit) 6pc Display (Contains 4 ea 701 Black & 2 ea 702 Brown) is a non-toxic formula that contains no coal tar derivatives or hydrogen peroxide agents. 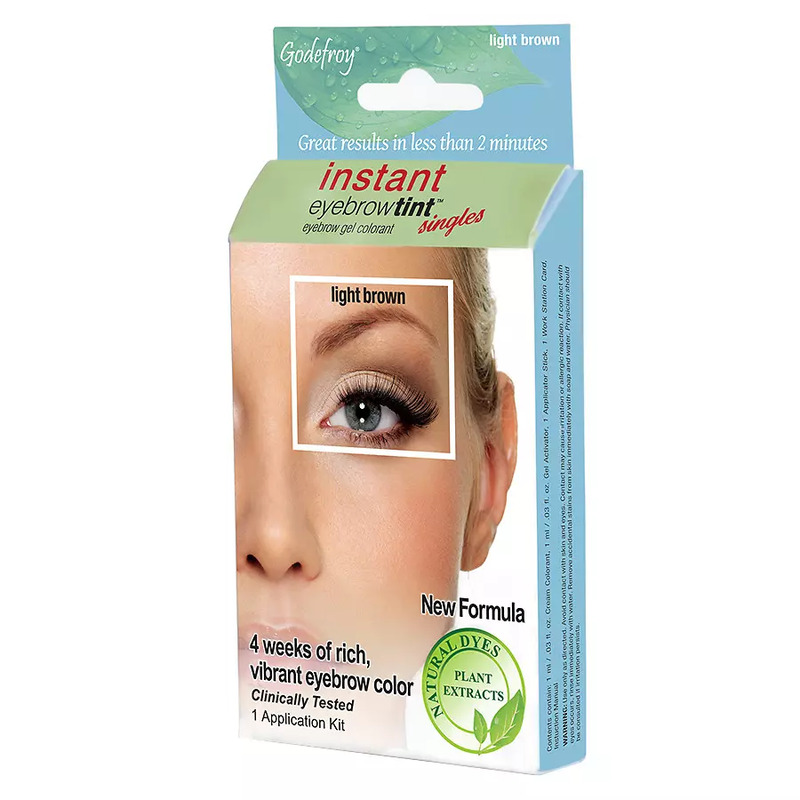 This fast acting, gentle formula does not damage the eyelashes and delivers rich, long-lasting color for up to 4 weeks. Made in Sweden. 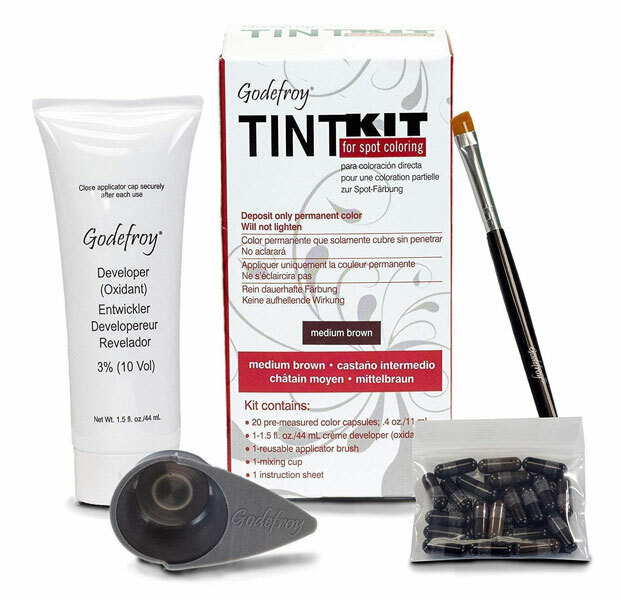 Godefroy Professional Tint Kit For Spot Coloring (20 Applications) is great for use on brows, beards, mustaches and side burns. Blended with pure white henna for rich and creamy consistency. Premixed, pre-measured color capsules insure perfect results every time. Effectively covers resistant gray and deposit permanent color. Long lasting, natural color, and will not fade. No odor and no ammonia. Godefroy Double Lash & Brow 6pc Display contains 6 pc of Godefroy Double Lash & Brow in cardboard display. Godefroy Double Lash & Brow is a 6 week nighttime treatment combining rich plant oils and vitamins to strengthen weak cuticles allowing lashes and brows to stay intact longer. For ladies with eyebrows that are too dark, now we have a product just for you, the Eyebrow Lightening Crème. Your eyebrows will compliment your hair creating a softer more natural look. 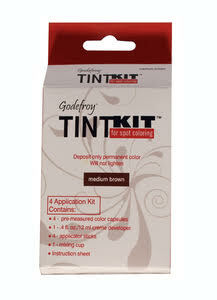 Godefroy Tint Kit for Spot Coloring (also known as Godefroy Instant Eyebrow Tint (4 Application Kit)) is ideal for coloring small areas of the scalp, eyebrow and facial hair. Pre-measured in separate units, it gives you the versatility to use the exact amount of color you need with no waste. Great for use on beards, mustaches, sideburns, temples...anywhere you need a little color. Covers the most resistant gray hair for up to 6 weeks. Cover that gray or enhance your scalp, eyebrow and facial hair color for up to 6 weeks, eliminating the need for extra makeup! No more daily application of eye pencils or eye powder. It covers the most resistant gray hair 100% in less than 5 minutes. It comes in easy to use one application capsules. 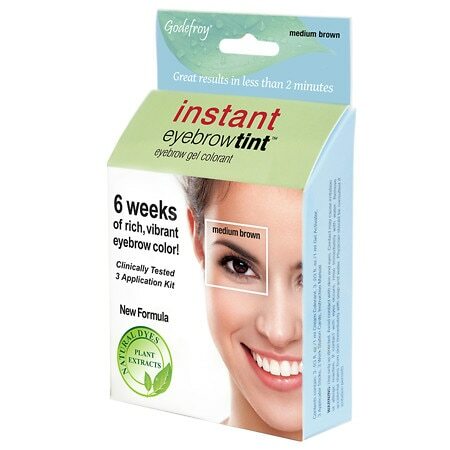 Godefroy Instant Eyebrow Tint is a great alternative for individuals with sensitivities to traditional hair color. A non-toxic botanical formula that contains no hydrogen peroxide or synthetic dyes. Formulated with plant extracts, this fast acting, gentle formula delivers rich, long-lasting color for up to 6 weeks. Covers the most resistant gray hair. A great alternative to daily eyebrow pencil and powder application! 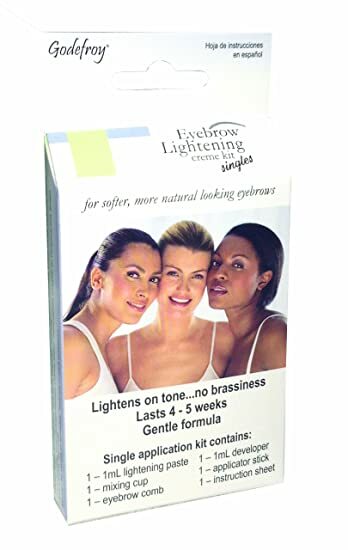 Please note Godefroy Instant Eyebrow Tint Botanicals (3 Application Kit) LIGHT BROWN, MEDIUM BROWN is currently out of stock; Item will be available again shortly. Covers the most resistant gray hair 100%. Long lasting color lasts for up to 6 weeks. Godefroy Instant Eyebrow Tint Botanicals (Single Application Kit) is great for coloring eyebrows, small areas, short beards, mustaches, goatees and side burns. Simple two step process takes less than two minutes to apply and process. A great alternative to daily eyebrow pencil and powder application. A non-toxic formula that contains no hydrogen peroxide or synthetic dyes! Inspired by the look of eyebrow microblading! Godefroy MyBrows are long lasting eyebrow transfers whose unique design is feathered to create a beautiful and natural looking eyebrow in seconds! Easy to apply and remove, MyBrows are waterproof and smudge proof, and with proper care can last for up to 5 days or more. 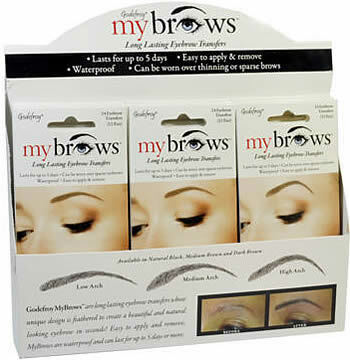 Godefroy MyBrows Long-Lasting Eyebrow Transfers in HIGH ARCH is available in 3 shades: Natural Black (1942), Medium Brown (1944), and Dark Brown (1943).